My friend, Blaine Harrington, is one of the most accomplished travel photographers in the world. He will be the featured photographer in an exhibit called “Unifying the World through Color” at the Denver Photo Art Gallery (for those of you in Denver it is John Fielder’s gallery at 833 Santa Fe Drive) starting on Friday, January 7 and running through Wednesday, March 2. This is just one small sample of his beautiful work. He will display photographs from his travels through Burma, Bhutan, Fiji, India, Namibia, South Africa, Thailand and the United States. Here is a photograph from Rajasthan in India with an explanation of how he got the shot. Blaine Harrington: One of my favorite things to do while traveling around the world is to watch people moving in their environment, going about their daily routine. Even better is watching women walking in India, wearing saris that are every color of the rainbow. I loved the motif of the wall in this scene and so waited for a woman in the right color sari to walk through. The bright red of this woman’s sari complemented perfectly the colors the floral background. As she walked the woman held a huge broom in front of her face to shield herself from the sun. 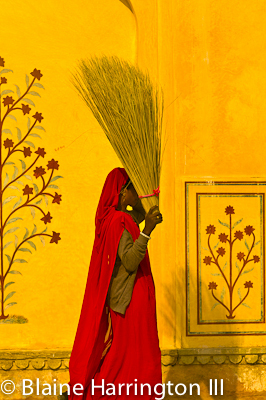 The broom added just the right amount of mystery and made the photo less about her face or more about the shapes and colors of the scene. Every year he invites me and many others to help him pick his portfolio for the Society of American Travel Writers competition. The pictures are stunning. If you love to travel, take photographs or just want to see artistry with light and color I highly recommend this exhibit. Blaine is a huge inspiration as I work on my photography. He has many more images from all over the world on his website. To see more of Blaine Harrington’s travel photography visit http://blaineharrington.com. Categories: Africa, Colorado, India, Inspiration, Media, News, News and Views, Photography, Random Thoughts, Travel, United States of America, Women | Tags: Bhutan, Blaine Harrington, Burma, Colorado, Denver, Denver Photo Art Gallery, Fiji, India, John Fielder, Namibia, Photography, Rajasthan, Santa Fe Arts District, Santa Fe Drive, Society of American Travel Writers, South Africa, Thailand, Travel, United States | Permalink.